Your Honeymoon doesn’t have to be a dream!…. Firstly, we’d like to say congratulations to you both and the fact you are reading this page, thank you. Thank you for considering us to turn that dream into a reality! We start with a blank piece of paper so whether you want that island of paradise, or a city break in one of the World’s capitals or even stay at home in the UK, not one element is an issue. 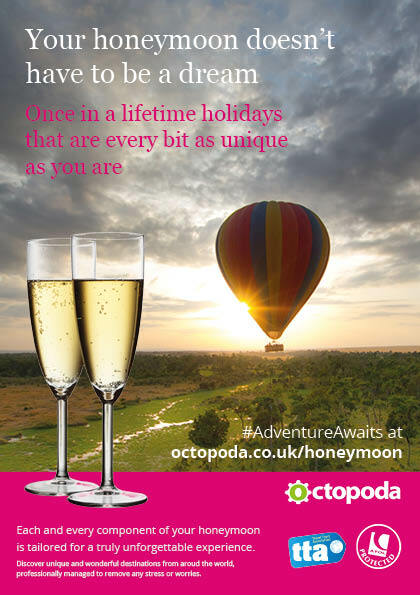 The team at Octopoda will work closely with you throughout the planning stage to create the most unique, memorable and most importantly tailored honeymoon where we will ensure everything meets your exact requirements. Throughout the process you’ll be allocated your own honeymoon planner who will be with at each corner and be on hand during your dream trip. Once again, thank you for the opportunity to create ‘the magical’ and we look forward to hearing from you soon.